Pop quiz: what is most widely consumed beer style on Planet Earth? Hints: It was originally brewed in what is now the Czech Republic, when that land was part of the German-speaking Austrian empire, however the first brewmaster was Bavarian. It is widely copied all over the world. If you get a Thai, Chinese, Tanzanian, Peruvian, or Mexican beer, it is probably this style. There are Czech (Bohemian), German, and American versions. Here is a hint….the original version was brewed in the city of Pilsen. By now, you have probably guessed that the beer style that took over the world in the 20th century and still reigns supreme in the 21st, is the pilsner lager, also known as pils. 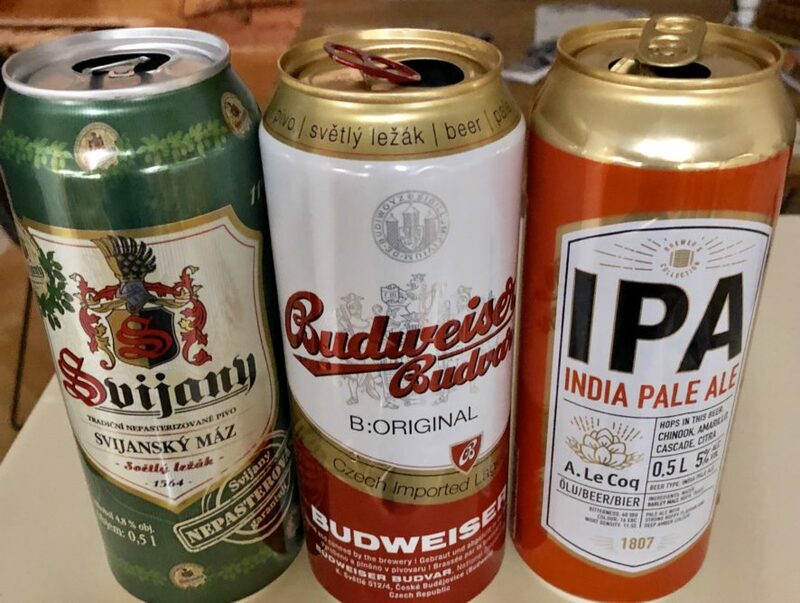 Budweiser, Miller High Life, Coors, Corona, Heineken, Pabst, Sapporo, Singha, and Red Stripe are just a few examples of beers derived from the pilsner lager style. Many of these use adjuncts such as flaked corn or rice, however the Czech and German versions are all barley malt with no adjuncts. The Czech pilsner is brewed with lager yeast and known for its light complex malt and spicy-floral noble Saaz hops balance. The most famous one is Pilsner Urquell, which is the original pilsner and still brewed in the city of Pilsen in the Czech Republic. We have become so smitten with pilsners that we took a trip to the Czech Republic. Should you wish to partake of pilsners in Prague, which incidentally is one of the most beautiful and culturally-rich cities in the world, we have some suggestions. We sought lots of guidance from friends, as well as Fred Waltman’s “Beer Guide Prague” (under a buck at the app store and a fantastic resource) and Evan Rail’s Beer Guide to Prague (which seems to be out of print but is downloadable from the Prague City Tourism website). We’ve distilled that and what we’ve learned into some handy guidance for the intrepid beer traveler. We also checked out https://stagmadness.com/blog/best-places-to-drink-in-prague to see where the best places to pub crawl were. Our suggestions here are far from definitive. 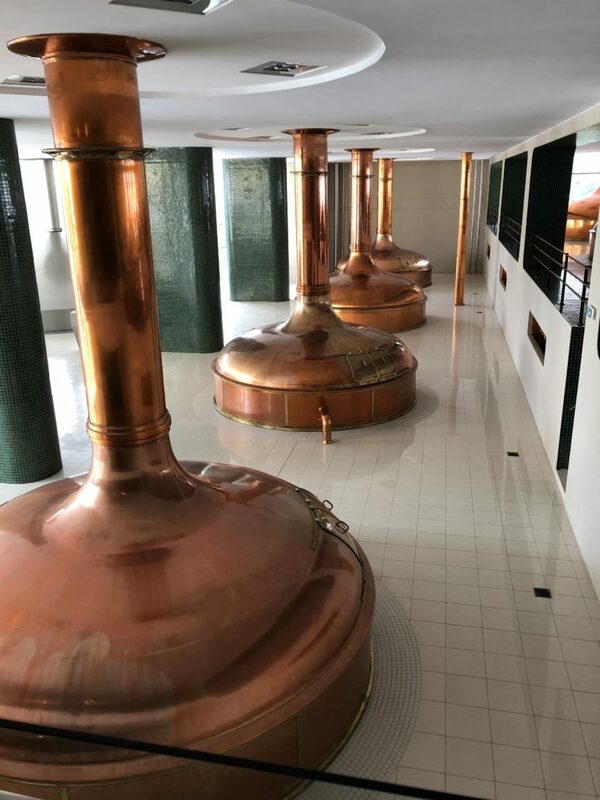 There are many great places that we didn’t get to, as we only had four days in Prague, and one of those days we took a trip to Pilsen to tour the Pilsner Urquell brewery. (It’s less than two hours by train and an excellent tour). First, some there’s vocabulary to become familiar with. The Czech word for beer is pivo. A brewery is a pivovar. Pivovars typically don’t offer flights nor do most beer bars. While there are exceptions, most bars and restaurants have only one or two beers, a brewery-restaurant (brewpub) typically has between two and five different beers. The standard size glass for a beer in the Czech Republic is a half-liter, 500 cc, or around 16.9 ounces. Most traditional bars carry only one brand of beer, either Pilsner Urquell, Budweiser Budvar, or Staropramen. 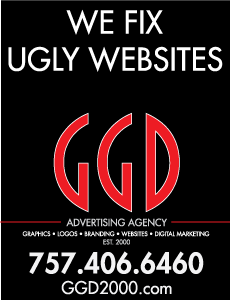 And, your choice within that brand is typically light (lezak) or dark (tmave). It makes ordering a beer pretty simple. No list of 20 drafts and 50 bottles to pore over when choosing your pour. 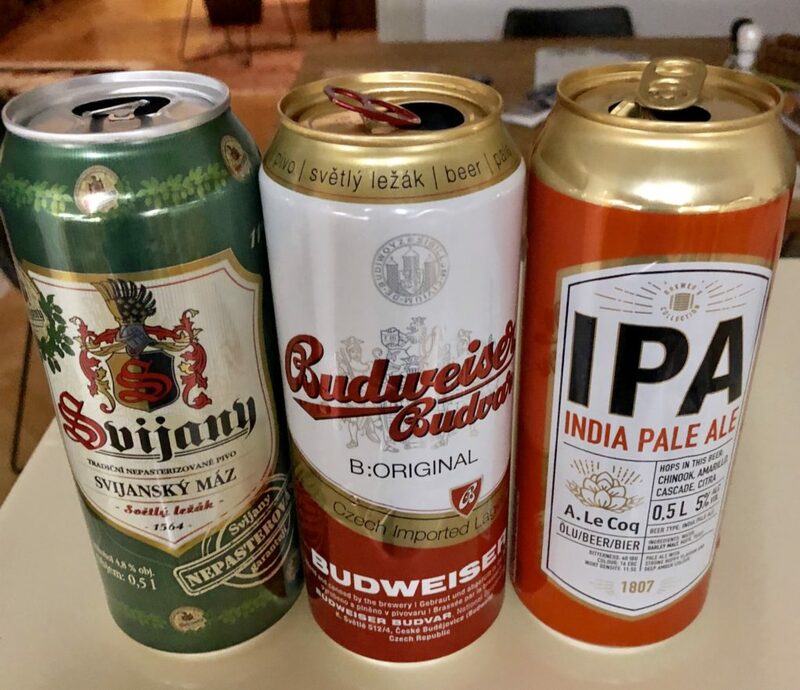 Another thing to be aware of is that Pilsner Urquell is the only pilsner that is called “pilsner.” The others are called “lager.” Sometimes you get a choice of how much foam (head) you want. Go with the least if you want more beer. Go with the second most if you want a couple fingers of head. The third level is basically a glass of foam! When traveling in the Czech Republic, you might as well get comfortable with drinking the traditional pilsners. They’ve been perfecting this stuff for over 100 years, and it is fresh, tasty, and quaffable. We never were huge Pilsner Urquell fans, as in the U.S. we generally get it light-struck from the green bottles and it’s not that fresh. In the Czech Republic your Pilsner Urquell will be fresh and delicious. And, for the most special version of Pilsner Urquell, look for the “tankova” sign. Tankova keg beer is unpasteurized and has a special ‘keg liner’ that protects the beer from oxygen. Pubs that offer tankova must meet stringent requirements regarding keg turnover, refrigeration, sanitation, and inspections. We stayed in medieval Old Town (Stare Mesto), which has many of the most popular tourist destinations, including the Astronomical Clock (currently under repair scaffolding, unfortunately), Clementinum, Tyn Church, Old Jewish cemetery and synagogues, and the Charles (Karlov) Bridge, a busker and artist-filled pedestrian bridge that connects you to the Little Quarter, also called “Lesser Quarter” or “Lesser Town” (the Czechs just call it Mala Strana). Just north of the Little Quarter is the Castle Quarter, dominated by the picturesque Prague Castle and spectactular St. Vitus Cathedral. We did our own beer touring, but wanted to check out some out-of-the-way less touristy places as well with a local guide who knows the beer culture. After an unsuccessful online search that yielded tours that looked pretty cheesy (“at the end of our tour you get a special beer diploma”) I learned about a small personalized beer tour operation called Taste Local Beer. I told beer guide Travis about our group’s interests and the places we would visit on our own, and he designed and led us on a terrific tour of three out-of-the way destinations, one was a brewery and two were locals pubs. First, I will mention places we visited on our own, and then describe the tour. We highly recommend Taste Local Beer for any visitor to Prague interested in beer! Golden Tiger (Zlateho Tygra) – Traditional pub that everyone says you must visit and “go early before the locals show up if you want a seat.” We went mid-afternoon and were cheerily ushered to a large table. Pilsner Urquell is your choice here. I’ve read that the beers were “tankova” but the owner told me “no, normal.” Location: Old Town. 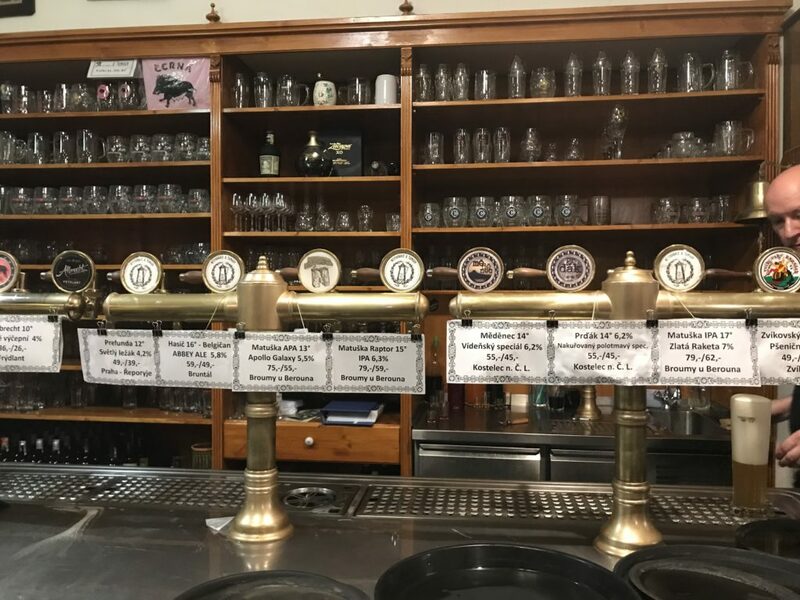 The Three Roses Brewery and Restaurant– (U Tri Ruzi Pivovar a Restaurace) – Small brewpub with three or four taps of traditional Czech styles, although you may find a wheat beer, Vienna Red, or IPA in rotation. Fun murals on the walls upstairs, we sampled characuterie and cheese. They sell their beer in bottles to take away. Location: Old Town, a few doors down from Golden Tiger. U Dobrenskych Pivovar – Small brewpub with hearty Czech food and four taps, including a lemongrass blond that was quite nice. Food options were hearty meat dishes or cheese marinated in oil. Not unusual in Prague….pack the psyllium! RateBeer Best New Czech Brewery 2016. Location: Old Town. Lokal – Dlouha – Lively and filled with young locals, a long cavern of a restaurant that has Pilsner Urquell tankova and a hip vibe. Maybe that’s just because we were seated near a colorful group of Bohemian bikers. Known for their traditional Czech kitchen and tasty fried cheese dish. Location: Old Town. There are two other Lokal tankova locations in Prague, Lokal Hamburk and Lokal U Bile Kuzelsky across the Charles Bridge in Lesser Town (Mala Strana). U Fleku – Said to the be only brewery in central Europe that has been brewing continuously since 1499. The historic décor and beer museum inside are worth a gander, and the beer garden is exceedingly pleasant in nice weather. The dark lager is tasty, as is the mead. Be aware that a waiter will walk by and start to serve everyone in your party a small taster of mead or another beverage (I’ve heard schnapps, but we were offered mead). In case you think it is complimentary, be aware it will be added to your bill. You can say “no (ne) thank you”, except for the mead lovers who will want to say “yes (ano)”. “No” can sound like “ano” which means “yes”, so nice to learn both words in Czech. By the way, you will want to write down a few words phonetically so you can practice speaking Czech. I know you’ve heard “everyone speaks English.” Two points: not everyone speaks it well, and it is simple courtesy to learn a few words in Czech and use them. It will be well appreciated. Letna Garden Beer Gardens (Zahradní pivnice Letenské Sady) – Open in summer, this shaded beer garden has Gambrinus lager on tap. It is recommended due to the beautiful panoramic view from a hill overlooking Prague. Directly across from the National Technical Museum. The Strahov Monastery Brewery (Klasterni Pivovar Strahov) – Close to and affiliated with the Strahov Monastery, this brewpub and restaurant has pretty copper brewkettles, a full menu and beers that divert from the traditional pilsner lagers. You will perhaps find an IPA, red ale, or wheat beer. Location: On the castle side of Prague, by the Monastery. Ready for something other than lagers? Try a craft beer bar in Prague! Zly Casy – The name means “Hard Times” but the extra effort to get here is worth it if you want to explore the Czech craft beer scene. A true craft beer bar with an excellent bottle shop next door. Craft breweries in the Czech Republic are brewing IPAs with new world hops, sours, wheat beers, fruit ales, stouts, you name it. Three floors with different taps on each, however all 48 taps aren’t necessarily active depending on when you visit. Take tram 24 or 7 to Otakarova, then walk toward the underpass but head right up Na Zameke, then left on Cestmirova. The other craft beer place of note is BeerGeek Bar, however we didn’t get there unfortunately. For a bar closer to Old Town with a very good selection of Czech craft beers, head to the Prague Beer Museum along the river just south of the Charles Bridge, on Smetanovo Nabi. The IPA and double IPA from Matuska were outstanding. (Note there are other places called “beer museum” in Prague that are not the same. One is actually a museum). And for something a little out of the ordinary, the Muzeum Medoviny, the Mead museum, is where you can taste meads made from all over the Czech Republic. Mead is fermented honey, and it can be sweet or dry, still or carbonated, made “pure,” with honey, water and yeast, or it can have fruit or spices added to it. Unlike the Pivovars, the Mead museum lets you get very small (under two ounces) samplers of 5 or 10 meads. You can get a mead mojito or just order a glass of mead. Vinohradsky Pivovar – A well regarded brewery restaurant in the “wine district” that serves two beers, a light lager and an amber lager. We toured the small brewery and had dinner here. Each couple shared an entrée and everyone was invited to order both beers. This was some of our favorite food on the trip and our tour was off to a fine start. Cafe Kolibka – Fresh Unetickey Pivovar, which you don’t see everywhere, at a small bar that sees few tourists. We delighted in the light lager and the pale lager. Just delicious fresh beer in a local hole-in-the wall. More food was provided, there was a tasty marinated cheese and something else…the beer was delicious and perfect and the memory is a bit hazy regarding the food but it was happiness-producing and ample. How to get around? The tobacco shop will sell you tickets that work for both tram and subway. And, it is simple to summon an Uber; there’s no Lyft in Prague. Taxis have a meter, but it’s just for show; cabbies in Prague pretty much wing the cost of a ride then charge extra. We found Uber was a great supplement to public transportation and used it extensively. Where to stay? We have two recommendations. They will let you pay in dollars, euros, or CZK. They prefer that you pay cash upon arrival, but if the customer insists (nicely) they will let you pay by credit card for no extra charge. For two or three persons, or a couple traveling with a child, I don’t think you can beat the Glass Rooftop Apartment in New Town. The main room of this modern apartment has a large bed and wall-to-wall glass windows, along with a small table and sitting area. Outside the window is a large private terrace with stunning views of Prague. There is a small kitchen off the main room, and the second bedroom is a very small room with a twin bed. The apartment is entered through the Franciscan Gardens, which is a tranquil green oasis in the heart of busy New Town. It’s about a twenty minute walk to Old Town Square, but you can always Uber or take the tram if you get tired of walking. This apartment, and others in the building like the Glass Suite Apartment, can be booked through www.prague-stay.com. Happy traveling and na zdravi (cheers)!